HANDMADE JOURNAL COVERED IN A VERY COOL MOTTLED GREEN FABRIC. IT MEASURES 8" WIDE x 8.75" HIGH WITH A WRITING AREA OF 6.25 x 8 3/88". INSIDE IS A THICK BOOK (3/4" THICK) OF CREAMY WHITE TEXTURED (A BIT LIKE COLD PRESSED WATER-COLOR PAPER) TEXT-WEIGHT, DECKLE EDGED PAPER, WHICH TAKES MANY MEDIA VERY WELL INCLUDING WATERCOLOR, COLLAGE, PENCIL AND INK. EVERY JOURNAL I SELL IS MADE BY ME AND HAS DECORATIVE ENDPAPERS. 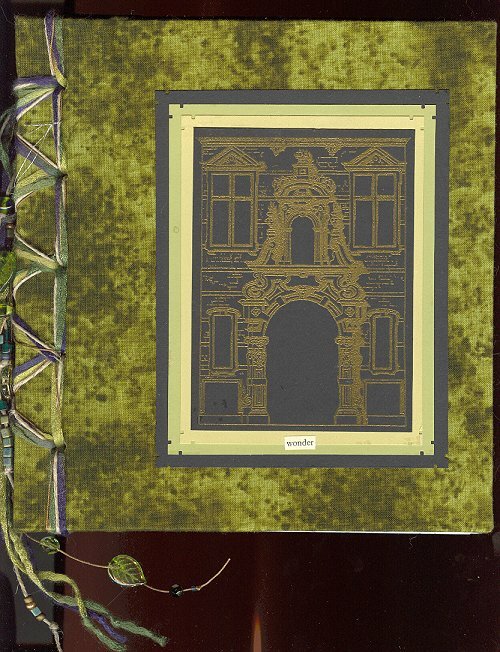 THIS PARTICULAR JOURNAL IS BOUND USING DECORATIVE FIBERS INCLUDING SILK AND HEMP AND EMBELLISHED WITH GLASS BEADS. THE ARTWORK ON THE FRONT IS ALSO HAND MADE.